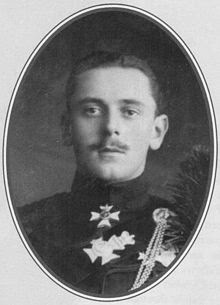 Prince Maurice of Battenberg, youngest son of Princess Beatrice and the late Prince Henry of Battenberg, was killed today "while serving with the British Army in France," reports the New York Times. Prince Maurice was an officer in the King's Royal Rifles Corps. He is the first member of the British royal family to be killed in the war since fighting broke out in August. According to one report, Prince Maurice was not killed in battle, but "died from wounds received in an engagement." Prince Maurice was 23 years old, and served as a second lieutenant. Sir John French, the commander-in-chief of the British expeditionary force in France, recently mentioned Prince Maurice "for meritorious service in the field" in his report to the Minister of War Kitchener. It would be reported in late October 1914 that Princess Beatrice received the details of her son's death. The Times reported that he was "leading his company in an attack when he was struck by a shrapnel bullet from a bursting shell and died almost immediately." Princess Beatrice gave birth to a "Prince at quarter to 7 yesterday morning, and both are going on admirably," reported the Court Circular. The new prince was born on October 3, 1891 at Balmoral. The Court Circular noted that new infant was "Her Majesty's 34th grandchild and 12th grandson." In the evening, a "bonfire was lighted at Craiggown; a torchlight procession was formed on the hill, and proceeded to the Castle in honour of the birth, in the morning of the infant son of Prince and Princess Henry of Battenberg." The day before the Princess gave birth to her fourth child, she and her husbad and their two eldest child, Prince Alexander and Princess Victoria Eugenie, went out for a drive. The infant Prince was baptized on October 31, 1891 at Balmoral Castle. The ceremony took place shortly after 1 p.m., when Queen Victoria entered the drawing room with Prince and Princess Henry of Battenberg, their two eldest children, Prince Alexander Albert and Princess Victoria Eugenie, and Princess Helena Victoria of Schleswig-Holstein. They were followed by Princess Christian of Schleswig-Holstein, who represented one of the Godparents, the Princess of Leiningen. The other godparents were the Grand Duke of Hesse and by Rhine, the Duke of Clarence and Avondale (represented by Sir Henry Ponsonby) and Prince Franz Josef of Teck, represented by Sir Fleetwood Edwards. The service was performed by the Very Rev. James Cameron Lees, DD, Dean of the Thistle and of the Chapel Royal of Scotland, and Chaplain to Queen Victoria. During the singing of one hymn, the Acting Master of the Household, Major General T Dennehy "conducted the infant Prince, who was carried by his nurse," and attended by Miss Minnie Cochrane, who was Princess Beatrice's lady-in-waiting, to the "places assigned to them. The infant, who was given the names Maurice Victor Donald, was handed to Queen Victoria, representing another godparent, the Duchess of Connaught, by Miss Cochrane. The Queen held her grandson at the font, where the Holy Sacrament of Baptism was administered. A royal Luncheon followed the baptism in the Dining Room. The Queen's servants and tenants, who were invited to the christening, had lunch in the castle's Ballroom. The infant prince was named for his paternal great-grandfather, Count Maurice von Hauke, Queen Victoria, and Donald, a Scots name in honor of his place of birth. In November 1911, the young Prince was appointed "from the Royal Military College, Sandhurst, to a Second Lieutenancy in the King's Royal Rifle Corps." This is was the same branch that his cousin, the late Prince Christian Victor served in until his death from malaria in 1900. Prince Maurice was survived by his mother, Princess Beatrice, his two brothers, Princes Alexander and Leopold, his sister, Queen Victoria Eugenia of Spain, and numerous first cousins, including King George V, for whom he fought, and Kaiser Wilhelm II of Germany, whose armies he fought against. The Prince was buried in a military cemetery in Ypres.